Summary of required fans for the correct ventilation of any industrial kitchen with non-compensated hood. Using an infographic scheme Casals Ventilación shows you which fans are needed for the extraction of smoke with fans inside and outside the hazardous area, but also those that can be installed for supplying air in the kitchen room. Ventilation in residential, professional and industrial kitchens is vital moreover in the adjoining rooms also, to guaranty the comfort, safety and health of the people in them. The two main systems to obtain a good ventilation are the extraction and supply; according to the regulations of each country and to meet the standards of hygiene, health, safety and energy savings. 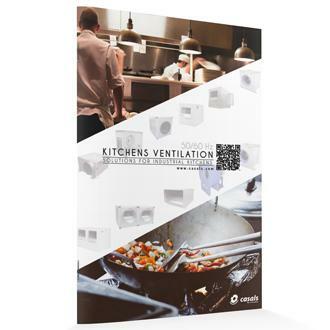 Discover the requirements for proper ventilation in industrial kitchens and the regulations under which Casals Ventilation manufactures its fans.